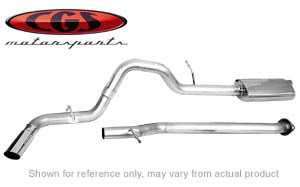 This CGS Cat-Back Performance Exhaust System for your vehicle is guaranteed to outlast and outperform every other cat-back system on the market. CGS uses 100% all-welded stainless steel high flow muffler, combined with mandrel-bent seamless tubing, and a polished stainless steel tip. 50 state street legal. Backed by a Lifetime Warranty this vehicle exhaust system will not affect factory warranty or emissions standards. Own this product? Send us your review!